I guess I shouldn’t have been so shocked, being part of an ethnic group that recklessly eats almost everything, and that the turkey is also served in the complete animal form anyway, with the head and neck and the rest.. But it just seems to be a completely different level of dining when it comes to this pig! Even though I am Chinese I found it revolting.. It’s the epitome Lévi-Straussdebate of culture vs nature!! When we eat a baby pig, we Chinese chop the head into half to make it less 3D, less erect and dynamic. We would have removed the eyeball and stuck a maraschino cherry in each socket. In other words, we ‘civilise’ our meat, so it makes us appear less cruel to ourselves (perhaps?).. 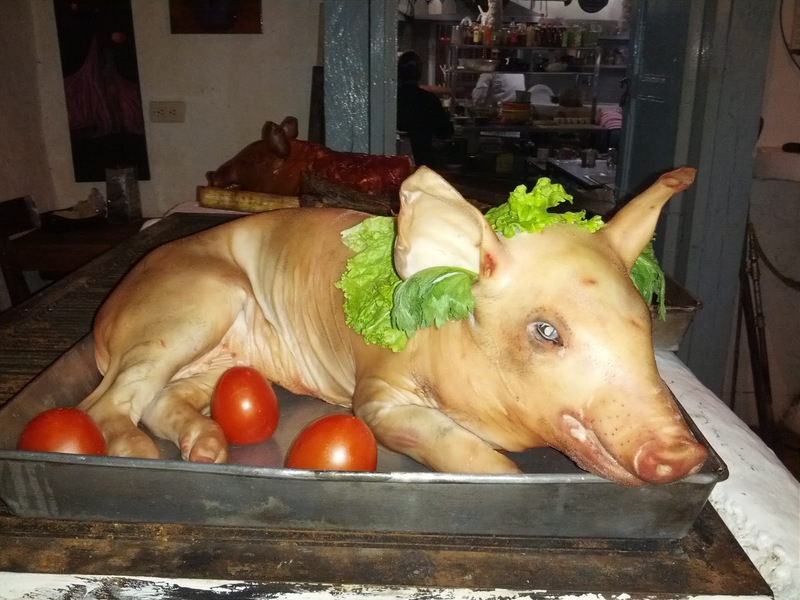 On the other hand, everything on this pig is left intact, carefully arranged on the baking tray as if the piggy would walk straight into the oven! The ears were still there, gently dangling; and the eyeballs were still glowing, the lashes looked so soft they looked like they would flicker at any time.. This is Lord of the Flies style of omnivore! Jesus..did you eat this!?? I don't think I can, that's really horrible…it looks like the animal was put into the oven alive!!! Of course it was alive… I mean… is there another way to do it? We (Colombians) are also obsessed about having fresh food… the same as in Hong Kong!!!! wahhhhhh it seems the piggy gotta move in any minute!!! Where the hell is that HF? the more you know, the less you enjoy..